You paid your Uber, Lyft, or other rideshare driver to get you somewhere safely. Unfortunately, that’s not what happened. Instead, an accident happened along the way and you were hurt. Since you were not a driver at the time of the crash the accident was not your fault, but in order to make a fair recovery for your injuries you will need to be the one to take action. Call the police. The police will come to the accident scene, make sure that everyone gets the necessary medical help, help prevent a secondary accident from occurring, and conduct an investigation about the cause of the crash that will result in a police report. Get immediate medical attention. Even if you aren’t sure how badly you were injured, it is important to see a doctor as soon as you can after the crash. This will allow the doctor to diagnose and treat any injuries you suffered and it will be important documentation for your legal claim. Get contact information from everyone involved in the crash. This includes all of the drivers, the other passengers, and any eyewitnesses. One or more of the drivers may be responsible for your injuries, and the passengers and witnesses may provide important information as to which driver (or drivers) should be held accountable. Additionally, it is important that you save information about your rideshare driver, including the driver’s name, license number, and contact information. You may screenshot the information about your trip and your receipt for the trip as additional evidence. Not speaking directly with any insurance adjusters. There may be multiple insurance adjusters from different insurance companies involved in your claim. They may all be friendly and appear to be trying to help you. However, it is important to remember that they have a job to do and that job is to pay you as little as possible for your claim so that they can maximize the profits for their employers. Finding an experienced car accident lawyer to represent you. Your lawyer can guide you every step of the way and remove the daily stress of trying to make the right decisions from your shoulders. For example, your lawyer can speak with the insurance adjusters on your behalf. These steps will not only help protect your recovery, but they will also decrease the amount of stress that you have to deal with while your rideshare accident case is being resolved. Who Should Pay Your Damages After a Rideshare Crash? 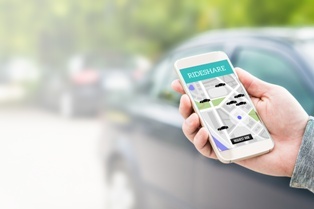 Liability can be complicated and strongly contested in a rideshare accident. Rideshare companies, such as Uber and Lyft, have liability insurance. However, the drivers are independent contractors, and the other drivers involved in the crash are likely not affiliated with a rideshare company at all. This can lead to a lot of finger pointing by the insurance companies and confusion as to who should pay you for your injuries. You shouldn’t be left with the financial burden of your injuries when you were not responsible for the crash that caused your injuries. Instead, we encourage you to take the right steps to protect your rideshare accident recovery and to contact our rideshare accident lawyers for a free, no-obligation consultation about your rights. Who Is Liable for Injuries in a Multi-Car Crash?